Hello everyone! This month am inviting all of you to bake some of your best dishes and link up. I love baking anything and everything in the oven. Just whip up something, put it in the oven, switch on the timer and forget about it.! Right? 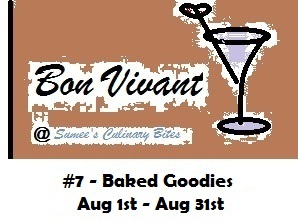 So any dish baked can be linked up for this month's Bon Vivant Series. Happy Baking! ~ Blog post should be in month of Aug.
~ Two old posts are allowed, if re-posted again in Aug.
Great event, would like to participate. Happy hosting! It's showing up right Shweta..